You, Me and Movies: Will "The Last Jedi" include "the most shocking reveal in Star Wars history?" Will "The Last Jedi" include "the most shocking reveal in Star Wars history?" I loved "The Force Awakens." But I do realize it was a polarizing movie. I am sure I have readers who groan by the mere image of a positive sentence pertaining to "The Force Awakens." But I did enjoy the movie quite a bit, and I continue to enjoy every time I sit down to watch it. I know it kind of looks like a remake of "A New Hope." But I think the movie worked differently because the new characters took center stage. I could argue more and more about what I thought worked about the movie. But I stand by my review I wrote almost two years ago now and I still love the movie today. I also know that the movie did not answer all the questions it raised, but when Hollywood pushes a trilogy of movies, you can't expect all the questions to be answered in the first film. One of the biggest questions raised from "The Force Awakens" concerned Rey's parentage. Who is Rey's family? Even though people connected to the movie said differently in interviews after the film's release, Rey has to be related to someone we know, right? Why would it be cool or exciting if Rey's parents were just a couple of schmoes in the galaxy who were Force-sensitive? 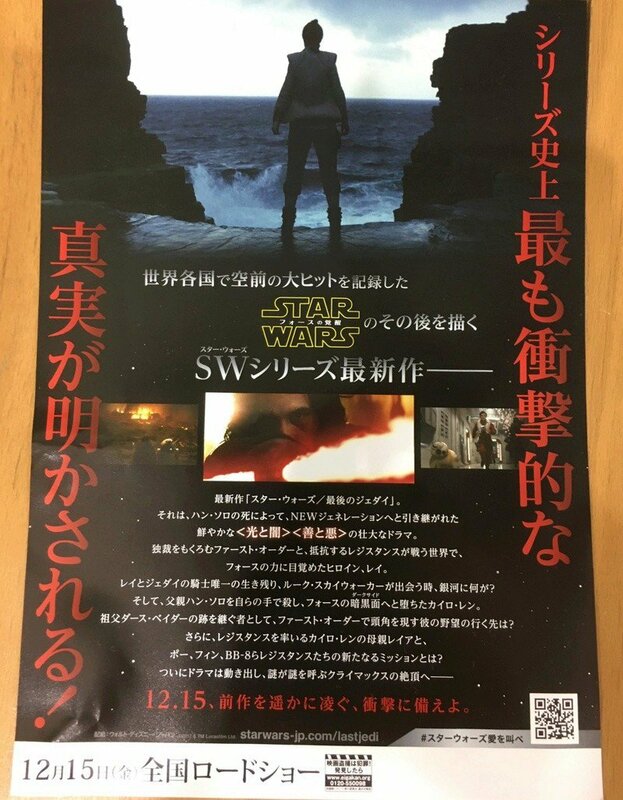 On www.StarWarsNewsNet.com, a Japanese leaflet was posted on the site. 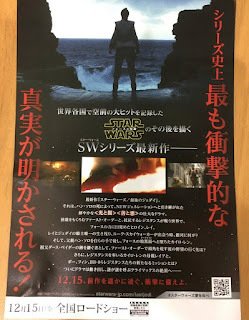 The leaflet pretty much said that "The Most Shocking Truth In Star Wars History Will Be Revealed!" I thought to myself, even more shocking than Darth Vader revealing to Luke Skywalker that he was his father? Even Anakin's realization that Chancellor Palpatine was a Sith Lord all prequel trilogy long? 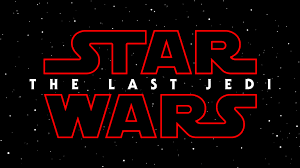 So does that mean we finally find out who Rey's parents are? Or what if Luke Skywalker has gone evil? Or at the very least, has become a Dark Jedi? The internet was an in uproar during the first trailer for "The Force Awakens" around who Kylo Ren truly was. There was a rumor going around that Kylo Ren was indeed Luke Skywalker. I always thought that particular rumor was stupid. But I do wonder if Skywalker has become disillusioned by being good, and I wonder if his Dark side will take a hold. No matter what, I think we are in for an installment unlike anything we've ever seen in "Star Wars." I think episode eight is going to hit every emotion we has human beings can possibly emit. I think this series is about to showcase some sharp turns and big twists. I know the use of words like "Shocking" and "History" is scary to some people. Even I understand that this could all be empty hype. I hope its not though, I really hope they are planning to take this saga in an uncharted direction! We, the audience, would be the winners if that happened. A new generation’s tale of the struggles of light and dark, virtue and evil has begun with the death of Han Solo. In a Galaxy where First Order and the Resistance are fighting against each other in a war, the heroine, Rey, had the Force awaken within her. What will happen to the galaxy when Rey and the only remaining Jedi knight, Luke Skywalker, meet? Kylo Ren has fallen to the Dark Side of the Force and killed his father, Han Solo. As a successor of his grandfather, Darth Vader, and a high ranking enforcer in the First Order, where will his ambition lead him to? Furthermore, Kylo Ren’s mother, the leader of the Resistance, Leia, Poe, Finn, and BB-8, will embark on a new mission! The story has finally begun and it will lead to a mysterious climax!